This is just a seed awakening everyone to the power and beauty of our diverse expressions of worship .. Tope Alabi carries a mantle and great depths in using Yoruba language in song ..it was an incredible experience making music with her .. every sentence out of her mouth made us feel like .. this!! is why God crafted this language .. ..LOGAN TI O DE (THE MOMENT HE STEPS IN) .. reminds me of Genesis .. God SAID , Let there be light:AND THERE WAS light.. That’s exactly what happens when we release God’s word over a situation, our lives and our nation .. .. He steps in. .. Instantly !! And everything aligns with His purpose . Yoruba is a very interesting language, one word can have varying meanings but this is not peculiar to Yoruba. I had fun praying over my life this past week with the word ‘Settled’. Settled means to resolve, to find an answer to. It also means to place or arrange into a desired state. 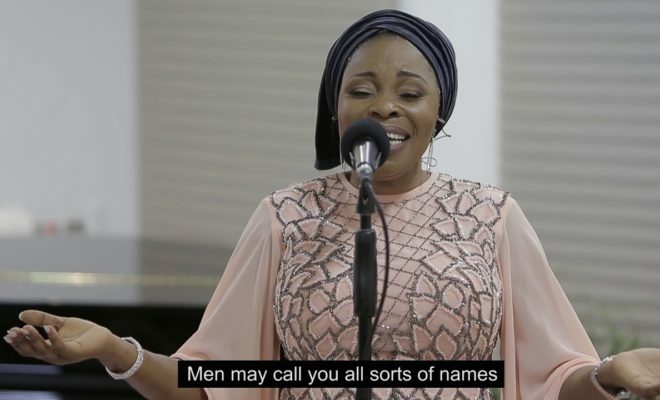 When Tope Alabi sings Logan Ti Ode, La Ye Mi Le To, it means- the moment God shows up..my life becomes meaningful or Settled.. transformed .. set in order .. rearranged.. programmed. one word .. many layers of meaning . In the song, she brings hope and empathy ..It is one thing to go through troubled waters but it hurts more when people define you by your troubles. But God is the one that has put power in his words to rename you and turn everything around IN A HEARTBEAT!. Thank you Lord Jesus for all that you are..